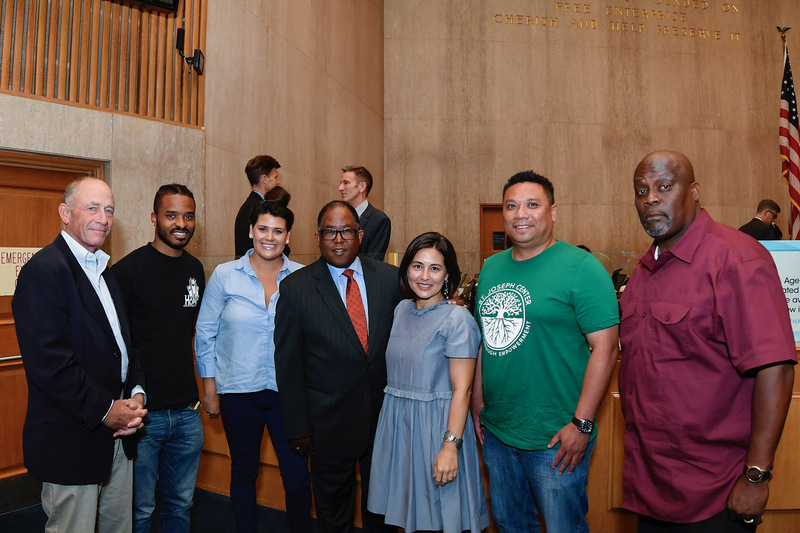 (Left to Right) Dr. Scott Sale, Safe Parking LA; Nathaniel Williams, HOPICS; Lindsay Jo Garcia, St Joseph Center; Supervisor Mark Ridley-Thomas; Emily Kantrim, Safe Parking LA; Christian Riehl, St Joseph Center; Andre Baker, HOPICS. Photo by Martin Zamora / Board of Supervisors. 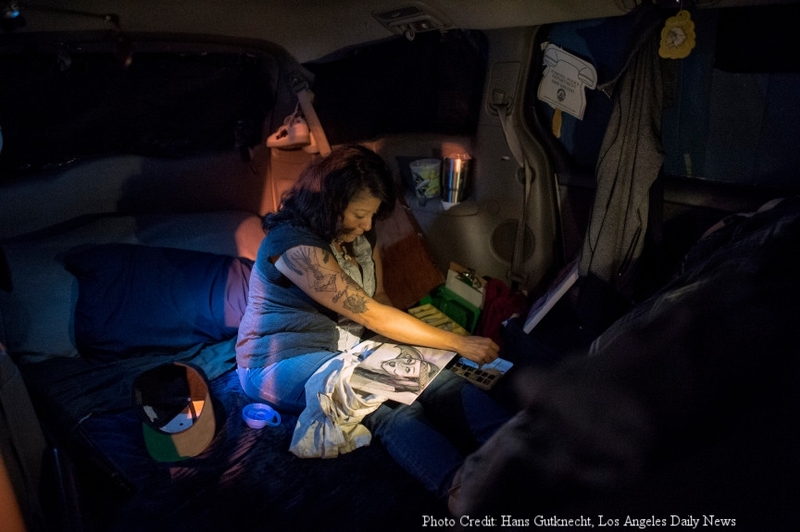 The Board of Supervisors approved a comprehensive set of solutions to build on the success of an interagency effort that has already helped 59 people living in vehicles move into stable, affordable housing over the past year. 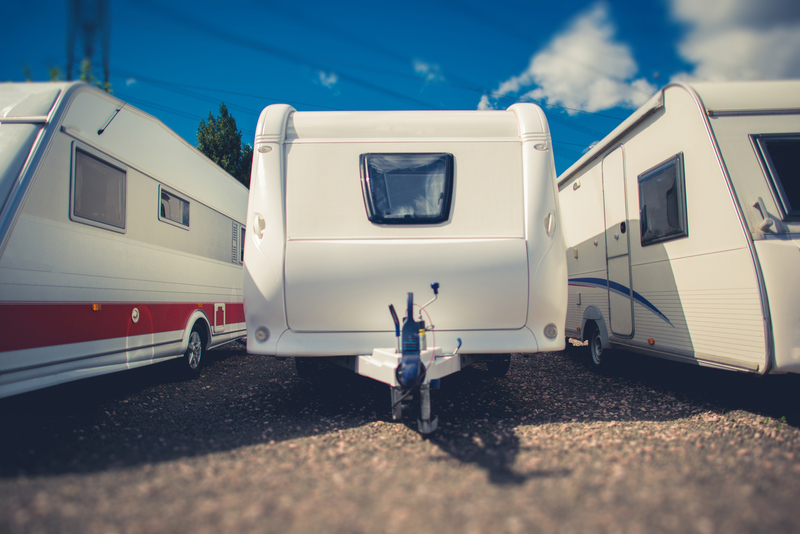 Authored by Supervisors Mark Ridley-Thomas and Sheila Kuehl, the motion called for expanding the use of public and private lots countywide to provide safe overnight parking to people living in vehicles, and for creating more sanitary conditions for them and nearby County residents. Photo courtesy of Safe Parking LA by Hans Gutknecht / Los Angeles Daily News. The motion also sought to curb the resale and reuse of dilapidated and unsafe vehicles where people had lived before finding housing, and directed the drafting of an ordinance to streamline the roles of public and private partners involved in complex issue. Finally, it called for establishing a pilot program to help the growing concentration of people living in vehicles in unincorporated West Rancho Dominguez, Rosewood and Willowbrook over the past decade. Over the last year, the County has been working closely with street outreach teams staffed by experienced nonprofit homeless service providers such as HOPICS and St. Joseph Center, who go out into the streets every day to offer services to the homeless. To date, their hard work has resulted in 59 people move out of their cars and into affordable housing. The motion also called for funding more safe parking options countywide. The County has been working with the nonprofit Safe Parking LA to provide safe parking at St. Mary’s Episcopal Church in Koreatown.